It might not seem an encouraging sign when you describe the state of your business with phrases like, “We’re still alive” and “We continue to survive.” Such is the way Peter Aaron opened our interview about Elliott Bay Book Company, his iconic bookstore that marks the 40th anniversary of its founding this year. But, before you jump to any conclusions, there’s more to the story. 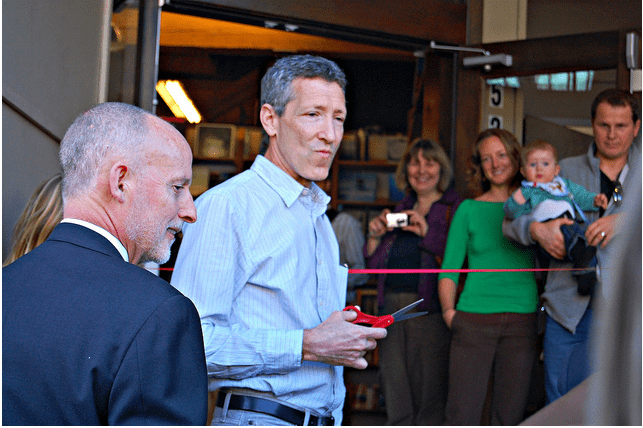 Let’s pick things up in 1999 when Aaron bought the independent bookstore, inheriting a literary legacy and a business model that, even then, looked destined to go the way of VHS rentals. Squeezed by big box chains, large discounters and the early rise of online sellers, the store had barely survived the three preceding years. 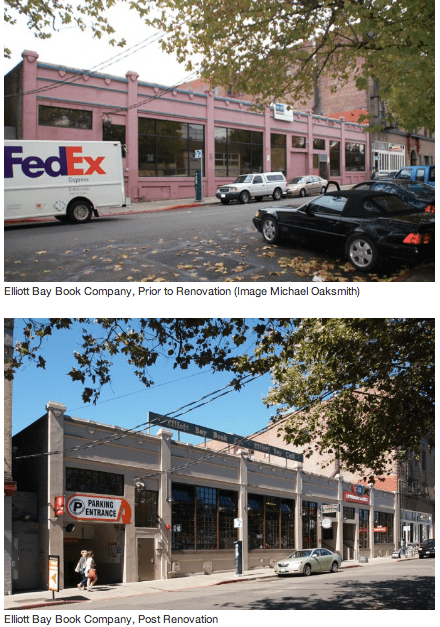 Nine years after the store had been featured in Newsweek as an example of successful independent bookstores, it seemed likely the next chapter for Elliott Bay Book Company would be followed by the number 7 or 11. 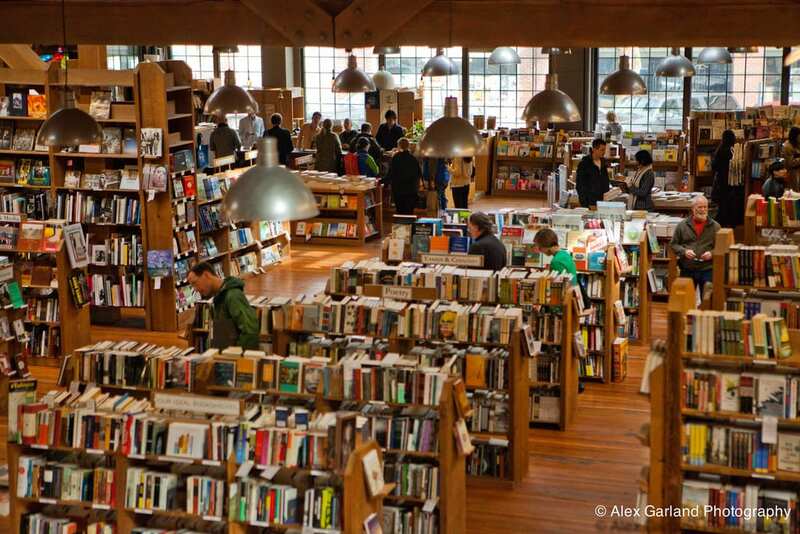 Since then, Amazon.com – which gobbled up market share like it was South Lake Union office space — and other online outfits have reshaped the bookselling landscape. In the U.S. last year, online retailers accounted for 44% of book purchases, up from 25% in 2010, according to industry research. This seismic industry shift has claimed large brick and mortar stores (Borders, B. Dalton, Crown) and small ones (Bailey Coy — RIP) alike. Simonson said he and other buyers draw on the customer knowledge they’ve developed as they continually refresh the roughly 150,000 titles. They also rely on the opinions of employees, whose eclectic passion for the written word is on full display on a shelf near the front of the store. This knowledge and love of all things literary extends to the owner. As for the future, Aaron said it’s hard to predict where the store will be in the next year, let alone the next 40. But, he is hopeful, in large part because the business has already endured many challenging circumstances. “We never get lulled into a sense of complacency. Just because we were around yesterday doesn’t guarantee our future. We have to work for it every day,” he said. 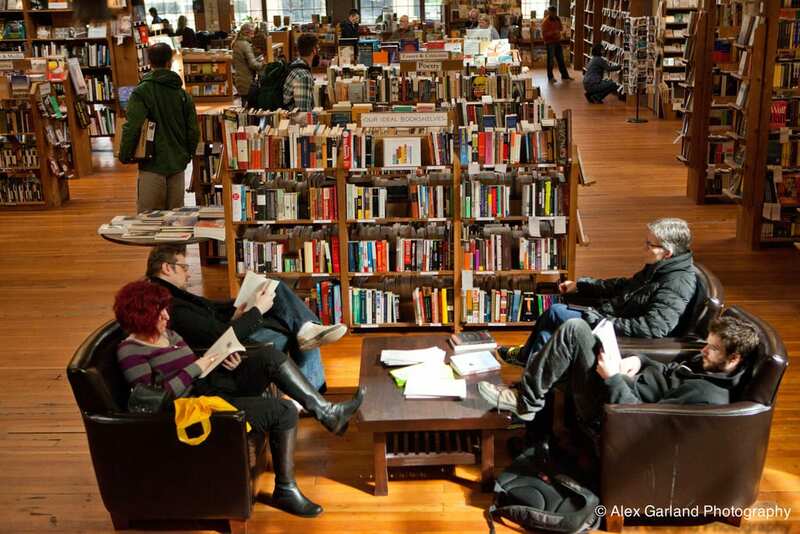 One thing Aaron is fairly certain of is that Elliott Bay will not shift additional resources to electronic books, even as more readers ditch print for digital. “There’s no money to be made, at least not for a little company like us,” said Aaron. He added that his store couldn’t add any meaningful value in the digital space like it could by hosting 500 or so author events every year. So as the business prepares to write the story of its fifth decade, it will continue to focus on the core themes that made it a nationally-recognized success during its previous chapters. Toward the end of our interview, I ask Aaron again to assess the state of his business and the outlook for the years ahead. His enthusiasm picked up as he described the advantage of “having a real community that supports us” and the continuing development and revitalization of Capitol Hill with light rail on the way. On this, our fortieth anniversary, we celebrate the past, present and future with this evening featuring three writers who in enormously popular, nationally (and internationally) noted novels published last year, did their own form of celebrating this city we call home. Olympia writer Jim Lynch’s Truth Like the Sun (Vintage), in large part is set in a Seattle of 1962, 11 years before Elliott Bay took wing. Maria Semple gave readers the bestselling Seattle book any of us have probably ever seen, and the funniest, this side of Tom Robbins, with her present-day set Where’d You Go, Bernadette (Back Bay Books). And Ryan Boudinot, in Blueprints of the Afterlife (Grove Black Cat), gives readers a Seattle we may or may not easily recognize, one in an uncertain near future. This evening should be a fun mix of all these times—and this time, this place, which we are delighted to be here for. This entry was posted in News, etc. and tagged business by Bernard. Bookmark the permalink. Bernard Choi is a CHS contributor. Love this place! You can feel how special it is walking in. Really, the care and attention to content and delivery is noticed and well appreciated. And damn right this place is rife with opportunity, good for them! 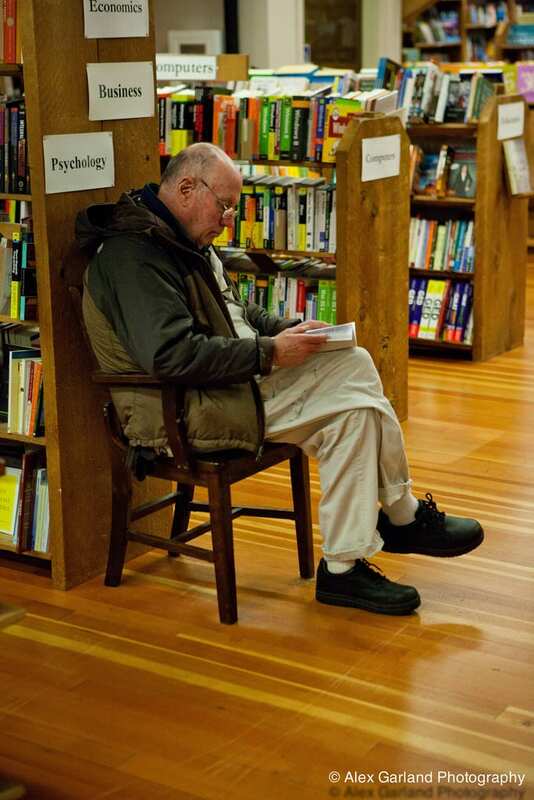 I love Elliott Bay Book Company, and I hope they make it. When I was in grad school at Western, I discovered one Sunday that I had to find and read a book by the next day for a seminar. The WWU Campus bookstore was sold out, and I quickly discovered that this obscure book was unavailable at any bookstore in Northwest Washington. I started working the phone, and called virtually every bookstore on the I-5 corridor. Nobody had it. Until I called Elliott Bay. They told me they had a copy, and they’d hold it for me. I got in my Subaru and raced down from Bellingham. I pulled into Pioneer Square, and instantly realized I was in trouble: it was a Seahawks Sunday. Football fans EVERYWHERE. No place to park. I flagged down a Seattle cop and told him I’d just driven 100 miles to buy this book, did he have any idea where I could park for 5 minutes while I ran into the store? The cop told me to just pop my station wagon up on the sidewalk, and he’d stand there next to it for a minute while I ran in to get the book, to make sure no other officer would come by and tow it. I drove the car up on the sidewalk, turned the hazards on, threw it in park and raced into the shop. Got the book, and was back in the car about 2 minutes later. Got a lot of weird looks from passersby for leaving the car on the sidewalk, but Officer Friendly made sure it was ok. Raced home, read the book, passed the class and eventually walked out of there with a Master’s Degree. Elliott Bay Book Company is an awesome Seattle institution, and I think leaving Pioneer Square was a smart move on their part. It’s not like parking grows on trees on Capitol Hill, but it’s not as bad as Pioneer Square on gameday. Transit is great, but it’s important to have SOME access to parking for us out-of-towners who want to patronize and have to drive into the city. I think their move was a smart business decision, and I look forward to buying a book there next time I’m in the 206. I bought an e-book that I’ve enjoyed immensely. I want to share this book with my mother and my mother-in-law, but they don’t have e-readers. I think this article just convinced me to go for a walk on this sunny day and end up at Elliott Bay Books,and buy a hardcopy of this book so I have it to share.